Xiang Yu Ping is a famous lawyer but he is known to be cold and ruthless. Yu Ping was left with his nephew and niece after his older brother died in a car accident. The mother also abandoned the two children after giving birth to them. Due to his busy work, Yu Ping always hired a nanny to take care of the kids. These nannies never last long as they were either scared off by the kids or ended up seducing Yu Ping. Feeling it was already a headache, Yu Ping asked his secretary, Yang Duo, to look for a nanny who would not seduce him and would not be scared by the kids. Yang Duo, who lost her parents and needed to earn money, saw it as chance to hire her own sister, Yang Guo, to be the nanny. Yang Guo is the perfect candidate as she was tomboyish and assured Yu Ping that she was really a tomboy. Yang Guo seemed to have a hard time to approach and get along with the two mischievous kids as they often play pranks on her. Nevertheless, she realized that these two were playing pranks just to get the attention of their uncle, who was always busy and doesn’t have time for them. Yang Guo relayed this matter to Yu Ping and convinced him to spend more time with them. On the other hand, Yu Ping had a secret relationship with a superstar named Hui Fan for many years. Hui Fan was always away and they rarely spend time together because of her work. They had a fight and Hui Fan broke up with him. Even though she regretted, her manager persuaded her to just focus on her career. The mother of the two kids eventually appeared and wanted to take back the children, and she was given full custody after everything was settled. Now, Yang Guo is jobless. Yu Ping has a best friend named Ke Zhong who is a talented interior designer. Ke Zhong offered Yang Guo to be his assistant which Yang Guo accepted. By this time, Yu Ping was having feelings for Yang Guo so he often dropped by their office just to see Yang Guo. Meanwhile, Hui Fan also returned and was trying to win Yu Ping back. Ke Zhong, knowing that Yu Ping likes Yang Guo, was asked by Hui Fan to help her. Ke Zhong couldn’t resist because he also liked Hui Fan back then, but Hui Fan chose Yu Ping instead of him. Ke Zhong tried to win Yang Guo’s heart, and it was a success. Seeing this as an opportunity, Hui Fan told the media about her relationship with Yu Ping. However, Yu Ping wasn’t happy and rejected her. She fell sick due to stress and Yu Ping felt guilty so he went back to Hui Fan. After her recovery, Yang Guo visited her and accidentally overheard a conversation between Hui Fan and her manager about Ke Zhong’s fake intention. Yang Guo broke off their relationship and disappeared. Yu Ping eventually found out about the situation, looked for Yang Guo and comforted her. Even if Ke Zhong realized that he actually loved Yang Guo, Yang Guo rejected him. With Yang Guo and Yu Ping’s time together, Yang Guo felt that she has feelings for Yu Ping too, so they ended up together. 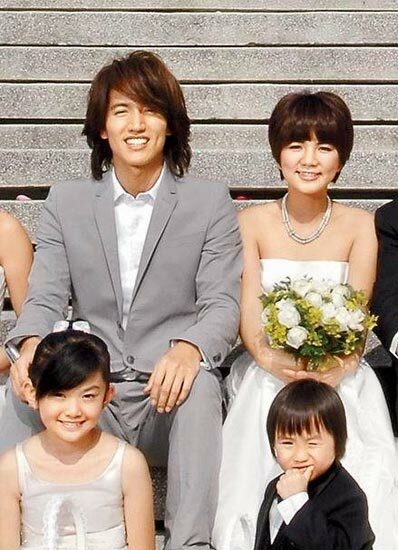 The drama fast forwarded 6 years later wherein Yang Guo gave birth to a son, and is pregnant with another kid. Jerry Yan Cheng Xu as Xiang Yu Ping — Jerry portrayed Yu Ping as a serious guy, but he seemed a little stupid. I think Jerry suits this character because he’s also serious in real life. You won’t really have a big laugh when you watch his scenes, but rather you’d burst into a cheeky smile. The way he smiles is really cute, and the way that he tries to stop his laughter, and of course his dimples. He was also cute when he gets jealous. His jealousy was over to the next level. This only proved how much he loves Yang Guo. Jerry isn’t that male lead guy that you’ll fall in love with one look, but it takes a while. If you looked closely, he has his own cuteness that you couldn’t resist! I personally think that his acting when he’s jealous, and feeling shy were simply the best. Ella Chen as Yang Guo — I guess Yang Guo was really meant for Ella. If there’s any tomboyish character, Ella would definitely be the perfect choice. Ella portrayed her role as an optimistic tomboy. Her acting was quite similar to Hana Kimi, maybe because of the similarity of roles? I liked her consistency in her acting skills though. I couldn’t say that she improved a lot, but there’s room for improvement in the future. I want to see her act a normal girl next time. The supporting characters were beyond awesome! I loved the casts. Michael Zhang as Qi Ke Zhong — I didn’t quite notice Michael in any other dramas that I watched, but he was noticeable for me in this drama. Blame his look in here where he wears glasses and he has a good hairstyle. 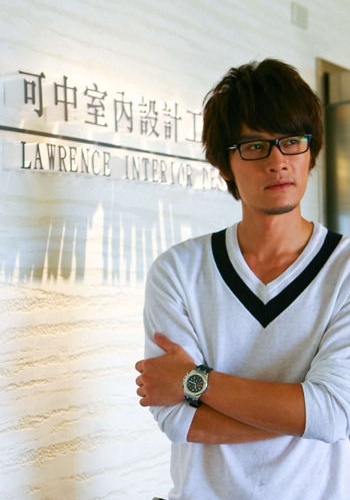 (You know, I have a soft spot for geeky guys >.<) I really fell for his character. Ke Zhong wasn’t really a nice character though as he tried to help Hui Fan and hurt Yang Guo’s feelings. Michael’s acting was good though. I also liked his love line with Kelly. They were also a cute pair! Kelly Huang as Yang Duo — Kelly or Xiao Xian is a good actress, considering that it’s her first acting project. She was natural and she wasn’t awkward even if some of the scenes/actions were over. As Yang Guo’s older sister, she portrayed Yang Duo as a responsible and a loveable sister that takes care of her sister. Yang Duo is a likeable character. I would definitely love to see Xiao Xian act again. Xiao Xiao Bin as Yu Ting and Ji Xin Ling as Yu Fei — These two brats are super adorable and makes the drama so much cuter and livelier. Xiao Xiao Bin looked so young back then and he doesn’t know how to act yet. I liked his performance in Autumn’s Concerto better. It seemed like he grew up so fast. I liked Ji Xin Ling’s portrayal of Yu Fei because she cared for her little brother so much, and she acts very mature and she surely knows a lot. It’s a pity though that the kids only appeared at the first few episodes and at the last episode. I mean, these two brats can act so well, so why waste their talent? They should’ve been given more lines and more scenes. Tsk. Tsk. Since this drama aired at the same time with Hi! My Sweetheart, I can’t help but make a comparison between the two, since they have similar genres. Acting wise, I think Show-Rainie were better than Jerry-Ella. 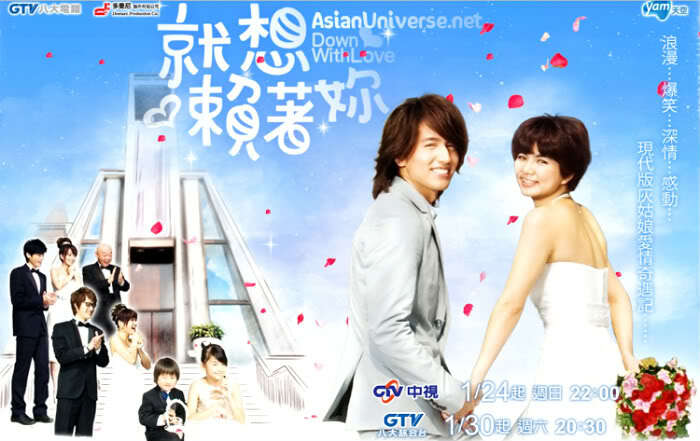 Show and Rainie showed something new and different from the characters that they portrayed while Jerry and Ella’s acting were quite ordinary. The plot was also ordinary while Hi! My Sweetheart was more interesting and it was never made before. For the music, I still chose Hi! My Sweetheart because their tracks were more attractive, addicting and catchy. The only thing that Down with Love won over Hi! My Sweetheart was the supporting characters. I think that these characters really helped the drama a lot, especially Michael and Kelly’s love line, while Hi! My Sweetheart was all about the two lead stars. It’s quite rare for me to finish a 16-episode drama in 3 days, but I finally did it in Down with Love. It just proved how I got hooked with this drama. Although it got the lowest rating among its competitors (Autumn’s Concerto and Hi! My Sweetheart), I still got entertained and I think this drama has its own beauty. Despite of the common-ish plot, I still recommend you to watch Down With Love especially if you’re looking for a nice romantic-comedy Taiwanese drama to watch. Bonus: don’t miss this part!